These are all good questions and the answers depend on the size of the client’s organization (quantity of personnel required to support the effort) as well as the level of commitment Management wants to make to Reliability Success. Reliability – The inherent ability of an asset to perform its intended function when called upon. Maintenance – Actions taken to ensure an asset is available and capable of performing its intended function when called upon. You can see that these two definitions, although very similar have 2 different meanings. It is the job of the Reliability Manager (RM) to periodically assess the reliability of assets to ensure they match the operational requirements and it is the Maintenance Manager’s (MM) responsibility to take intervening action when they don’t. Therefore, the positions of RM and MM are different. In an ideal and successful Reliability Organization the RM would be a full time position reporting to the Plant Manager. This allows the RM to have the implied authority of the Plant Manager in bringing together both Maintenance and Operations to address Reliability Issues in the most effective manner. If the RM reports to Maintenance then any programs or initiative the RM develops are viewed as maintenance issues and just the opposite if the RM reports to Operations. Additionally, this must be a dedicated position so that the individual can take an objective role separated from the day-to-day issues being addressed. 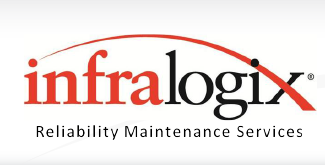 It is the RM’s role to review any completed maintenance actions for lessons learned for future occurrences, look for repeat failure conditions, identify design or training deficiencies (RCFA) that need to be corrected, and to be the Champion of the on-going Reliability improvement efforts. In support of the RM, there also needs to be the position of Reliability Engineer (RE). How many REs will depend on the size of the organization. This role involves the investigation of failures, conducting Root Cause Failure Analyses (RCFA), limited redesign projects, and assisting the RM in the proliferation of the Reliability Improvement Initiatives. Again these are not collateral responsibilities of maintenance supervisors but dedicated efforts by properly trained engineers. Finally, where in the organization do you put the Predictive Technologies group. Traditionally, in many organizations, they have been under the auspices of the RM because many believe the technologies are synonymous with Reliability when in reality they are not. The use of technologies (vibration, IR, Ultra Sonics, Oil Analysis, etc.) are merely tools to evaluate current asset conditions and trend failure progression. In many instances, the same could be said for visual inspections, go-no-go tests, Operator rounds, etc. The purpose of all of these is to identify impending failure so that corrective action can be taken in a planned and scheduled fashion to avoid actual functional failure. The employment of technologies or visual inspections are merely tools to accomplish this task and as such the personnel assigned should fall under the maintenance or operations department as applicable. However, the RM and appointed REs job is to help the organization define what information should be collected and evaluated in order to measure and maintain the inherent reliability of the assets and therefore should fall under the Plant Manager. 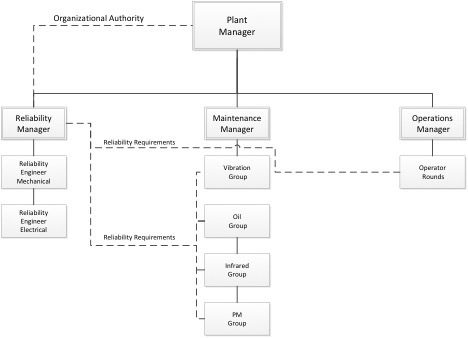 Below is one example of an organizational chart for the Reliability Department. Notice that the tools fall under Maintenance and Operations and the requirements fall under Reliability.